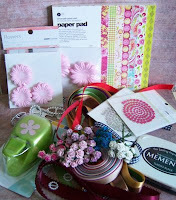 Debby4000 at A Scrapjourney has a candy going on right now! I added it to my side bar some time ago and just realised that I haven't written a proper post about it... Shame on me. 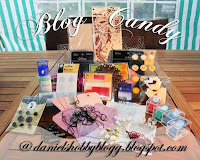 Daniel's blog is a year old and he's celebrating with this candy. Visit him for some great vintage/shabby chic projects! And then there's Camilla with her gorgeous Magnolia cards. She's giving away some excess stuff from her DT package! Hei Eva! Takk for at du deltar:) Og lykke til!